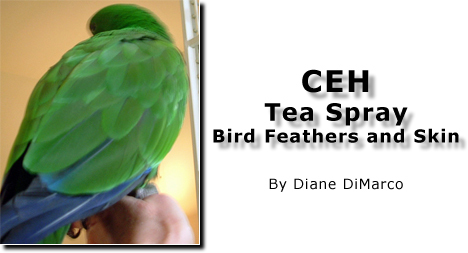 Out of necessity for my own birds, I learned to brew a natural tea to use as a spray for skin itching and feather destruction. A product for people, CEH cream/ointment, has been around for years. I don't know who originally came up with this combination of ingredients, but it is meant to be anti-fungal, antibacterial and anti-inflammatory. I thought that if I could purchase the organic ingredients, brew this and then place in a spray bottle, I might be able to help my birds...and it worked. The company that I use for the ingredients is Starwest Botanicals, Rancho Cordova, CA - Starwestbotanicals.com. They come beautifully packaged (very clean and fresh.) Sometimes they are out of the whole organic calendula flowers and you can use another vendor who resells Starwest's products such as Vitacost on the web. It just made sense to me that in the wild, when it rains, most birds will seek shelter under the canopy of the trees. The water that eventually reaches their bodies has picked up all sorts of things that the acidity of the rain has released from the leaves, bark, pollen, flowers, etc. There may be some medicinal properties to what we think is just plain rainwater depending on what part of the world you are in. Even in arid climates, there is condensation (dew) that collects on surfaces and birds in the mornings. Dust baths may also contain some necessary components for keeping feathers in good shape. Place herbs in a small, fine mesh strainer and pour boiling water to very top of rim of the measuring cup so that the herbs are under water. There is a small tea pot (called a Tea Ball) that QVC sells that has the finest stainless steel mesh basket that I've ever seen to brew tea, which would be easier than this. The 2-1/2 cup size Tea Ball works with this recipe. For the 5 cup size Tea Ball, you would double the recipe. Spray birds well paying special attention to the legs and feet (soak well here.) This is where many birds start with itching, biting and pulling of feathers. Please don't keep tea in the spray bottle and place in refrigerator. Plastic leaches some nasty things. I use a canning jar (Ball/Mason) which works very well. Also, rinse the spray bottle and nozzle and allow it to dry after each spraying. People can use this as a great facial toner; cold out of the refrigerator on a hot day is wonderful. It is also nice to have this on hand in case of a skin injury to use as an antiseptic while waiting for veterinary care. I like to think of this also as a bird sanitizer. I have researched the properties of these ingredients and St. John's Wort is the one with possible side effects...interferes with hormonal therapy and has caused spontaneous abortion in cattle that ate an abundance of it in the fields. I would think that in a diluted spray on the body that this wouldn't be quite the same, although birds do groom their feathers. 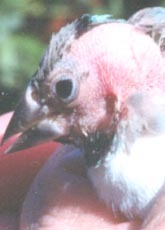 For this reason using on breeding birds may not be appropriate. White feathered birds, such as cockatoos, may have a little yellow discoloring of the feathers due to the yellow of the calendula flowers. Then again, slightly yellow feathers may be better than no feathers at all. I would start out using this every day. You should start to see a reduction in itching, scratching and biting at the feathers within a couple of days. Within a couple of weeks new feathers should begin to grow. Keep using the tea every day until the new feathers are nearly fully in (sometime 3 months.) Then you can back it down to a few times or less per week as a maintenance shower to keep them under control. I have been using this for nearly one year and when I go for a week without one tea shower spray, the itching seems to return. Note: Something curious about the tea...it seems to really help with preening glands that may not be functioning well. For years my female would off and on get a bad breath smell after trying to distibute oil from her gland. She had been to the vet and I had tried more vitamin A, warm soaks, but no difference. Since I have been using the tea the smell has been absent and her back feathers bead up water much better. Another person I know with the same problem also was pleasantly surprised by the results. Good luck to all and I hope that you have success with your birds. 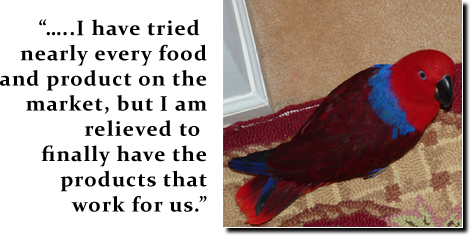 My birds are on a diet made by me of many organic ingredients (both dry cage mix and cooked dinner each night.) 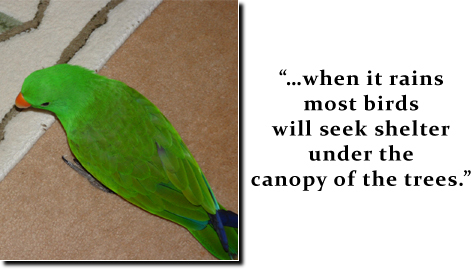 Eclectus parrots can be very difficult to keep in good feather and they have much trouble with prepared diets. I am a firm believer in Dr. Marshall's health products. I use the complete program that he offers for my birds. At first, it may seem overwhelming...all of these products and some on different days. It really is a system designed to work together. Used correctly, you will see results and what a beautiful shine the new feathers will have. They have made a huge difference in the condition known as toe tapping and wing flipping in my female Eclectus. I have tried nearly every food and product on the market, but I am relieved to finally have the products that work for us.